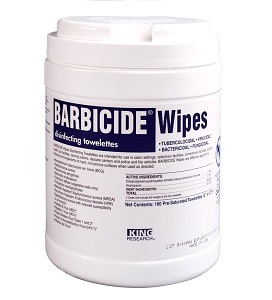 Time is money and Barbicide Disinfecting Wipes maximize both! These economical, easy to use disinfecting wipes are EPA registered hospital grade and have a 2 minute contact time assuring your salon, spa or barbershop meet sanitation and disinfection guidelines in just a few short minutes! DO NOT USE ON SKIN. DO NOT REUSE TOWELETTE. DISPOSE OF USED TOWELETTES IN TRASH. † Does not include the weight of the dry towelette.